Disclosure: This visit to Cinepolis was hosted, but all thoughts and opinions are my own. The whole essence and inspiration to my blog is mine and my family’s love for movies–particularly, animated films. Whenever a new Disney or Pixar animated film is released, my husband and I get so excited to take my daughter to see it in the theaters for the first time. With such incredible storytelling, dazzling animation, and memorable characters, we always know that these films will be meaningful to our family for generations to come. That’s why when we see a new Disney or Pixar film for the first time, I want the whole theatre experience to be equally as memorable! 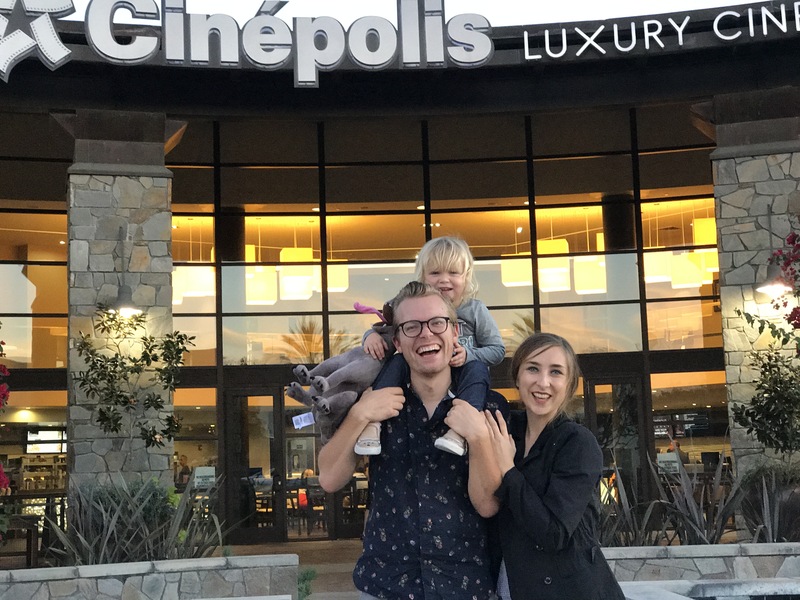 One of my favorite places to go for a movie-goer experience that’s always a blast is Cinepolis Luxury Cinemas (I go to the one in Laguna Niguel). When you purchase tickets, you chose your reserved, reclining luxury seats. I love this aspect of Cinepolis, not only because the seats are super comfy, but since I have an antsy toddler I like going to the theatre right when the movie starts. Having a reserved seat allows me to do that, as opposed to having to go to the theatre a half hour or so beforehand to get a good seat. Once you’re at the theatre and relaxing, you can buzz a waiter to come to your seat to take your order for a wide variety of beverages (both non-alcoholic and cocktails), popcorn, or from their gourmet food menu. We went to see Disney & Pixar’s Coco at Cinepolis to have a fun-filled, luxurious family night. Since it was during dinner time, we of course wanted to order some food in addition to popcorn! I love that they have a wide array of healthy options (it’s quite pleasing to this ‘healthy mouse’). My favorites are their gourmet salads, and their epic cheese plate with three different cheeses, nuts, apple slices, bread and fig jam. We brought blankets from home, and my daughter brought her Dante doll to the film. We raised the armrests between our seats, and all snuggled in our big reclining chairs under the cozy blanket, snacking on our cheese plate, popcorn, and made a Thanksgiving evening to remember! You can learn more about Cinepolis by visiting their site here!